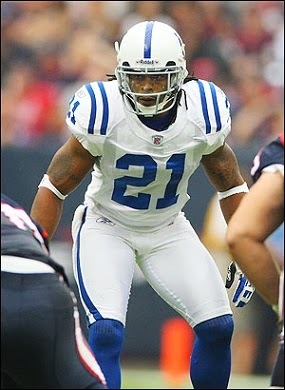 Attracted by his speed and athleticism, the Colts selected Sanders in the second round of the 2004 NFL draft. While he was limited to six games as a rookie due to a holdout and injuries, he showed off a physical style of play that belied his size and also performed well in coverage. Sanders excelled in 2005, achieving consensus first-team All-NFL honors as well as being selected to the Pro Bowl. However, a knee injury limited him to four games in 2006. Colts went 13-3 to finish first in the AFC South while leading the NFL in fewest points allowed (262) and the AFC in fewest passing yards allowed (2764). Lost AFC Divisional playoff to San Diego Chargers (28-24). The outstanding season in 2007 was followed by four injury-plagued years as Sanders’ hard-hitting style of play began to take a toll. He appeared in only six games in 2008 and three over the next two seasons before being released. Sanders caught on with San Diego for 2011 but appeared in two games before being shelved by a knee injury. Over the course of eight seasons, Sanders intercepted 6 passes and was credited with 226 tackles and 78 assists. However, he played in just 50 games, only twice appearing in more than six in a season –yet achieving consensus first-team All-NFL and Pro Bowl honors in those two seasons.